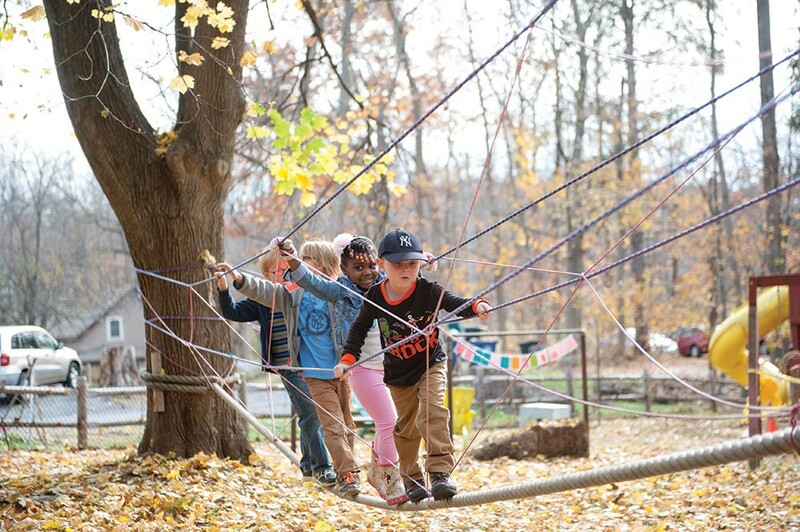 K-1 students climb the obstacle course during Forest Mondays at Randolph School. It was Tasty Tuesday at the Hudson Valley Sudbury School (HVSS) outside Woodstock. Or so four boys deemed it for their improvised game. The oldest stood atop a landscape of stacked car tires suggesting words, and the younger boys, balancing on a beam nailed horizontally between two trees, referenced each by making a shape with their bodies. It was a mix of free association and language arts classification. They exercised their kinesthetic needs while balancing on playground structures, developing both social skills and higher-order thinking, all through a variety of learning styles. But mostly, it was fun. There's an inherent freedom to this kind of imaginative play. According to Read and Patterson's The Nursery School & Kindergarten (Thomson Learning, 1980), it's determined by the player, so it's voluntary, and demands improvisation. Researchers and educators agree that play is where children act out viewpoints and scenarios, practicing communication, social skills, problem solving, and creativity. As Scott Barry Kaufman, PhD, pointed out in Psychology Today in 2012, "Over the last 75 years, a number of theorists and researchers have identified the values of such imaginative play as a vital component to the normal development of a child." But playing at school is becoming controversial. According to teachers, most of the professional development emphasizes raising test scores and meeting standards, basically quantifying a profession that used to rely on expertise in child development and creativity. HVSS looks like a college dorm—notes hang in the hallways and people sprawl out on couches. There's a communal phone that anyone can use at any time and kids as young as five can go outside at any point in the day to play in homemade teepees or a spot in the woods that is called The Laboratory for no obvious reason. Staff member Matthew Gioia considers access to the outdoors a basic human right, and says, "All the complex movement our students engage in has more benefit for their brains than crunching numbers." HVSS students aged 5-19 decide when and what to study. They're supervised, but not at the level we've come to expect. An adult might or might not be with them, so the kids are held responsible for themselves and for each other. Through a Judicial Committee, rules are decided and upheld democratically. "There are probably more laws at HVSS than at any other school," says staff member Vanessa Van Burek, one of the founders. "There's unlimited freedom, academically, but they're living in a community that governs itself carefully." Everyone is accountable to and for the other 80 to 90 students and staff, and Van Burek says students respect that responsibility. The learning that Sudbury fosters is grounded in an internal trust. It's hard to imagine how kids who play Magic Cards and then go climb a tree will fare beyond Sudbury, though. Play is unpredictable. Its intricacies are sometimes unnoticed and the attributes are subtle. Maybe that's why educational philosophies often treat it like a four-letter word. Play is fun and fun is frivolous. And that's not what we want for our kids. Van Burek acknowledges that most HVSS students develop knowledgee around personal interests and may have gaps in traditional curriculum. They have the underlying skills needed to be successful in life, though. "To go to college, or get a job," she says, "you don't have to have a wide body of knowledge; you have to know how to get the knowledge. That's what they develop here." Whatever deficiencies students may experience, educators and psychologists are routinely surprised to see how easily kids catch up simply based on readiness. HVSS places its faith in self-guided exploration because they value the quality and efficiency of learning that students cultivate by answering their own questions. Traditional schools don't always function that way. The George Washington Elementary School in Kingston is unique. It's a public option that meets the Common Core standards while using Montessori learning materials. Originally developed to teach orphans how to care for themselves, the Montessori philosophy places value on a child's play, deeming it work, and designing learning activities that are both instructive and playful. In Felipa Gaudet's Elementary I classroom at GW, which accommodates students in grades 1-3, children learn through a series of activities that are set up like games. In one such, called The Bank, children learn symbols for numbers, connect those symbols to real-world counting materials (the classic Montessori golden beads), and learn how to do basic math operations. Creek Scouts is happening at the Randolph School the last two Saturdays in January, where kids can learn all about how to enjoy the wintery landscape. At Vacation Camp and all of the Flying Deer Nature Center programs, kids internalize new possibilities for themselves as they awaken to the joys of self-directed learning.